Grilled steak and grilled vegetables. 1. Chop 4 onion wedges; combine with marinade ingredients. Marinate beef steak in marinade in refrigerator 6 hours or as long as overnight. 2. Thread remaining onion wedges onto two 12-inch metal skewers. 3. Remove steak; discard marinade. Place steak on grid over medium, ash-covered coals. 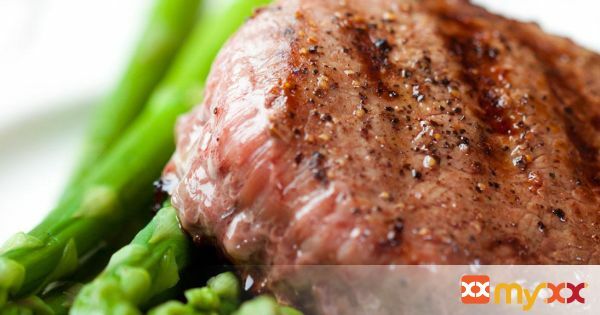 Place kabobs and asparagus around steak. Grill flank steak, uncovered, 17 to 21 minutes for medium-rare to medium doneness, turning occasionally. (Grill top round steak, uncovered, 16 to 18 minutes for medium-rare doneness, turning occasionally.) (Do not overcook.) Grill vegetables 9 to 12 minutes or until crisp-tender, turning occasionally. 4. Remove onions from skewers; toss with asparagus and 3 tablespoon vinaigrette. Carve steak; season with salt and pepper. Serve with vegetables.